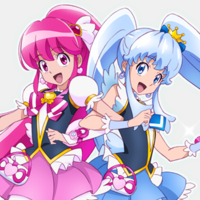 Toei is gearing up for the 10th anniversary of magical girl franchise Pretty Cure with HappinessCharge PreCure! 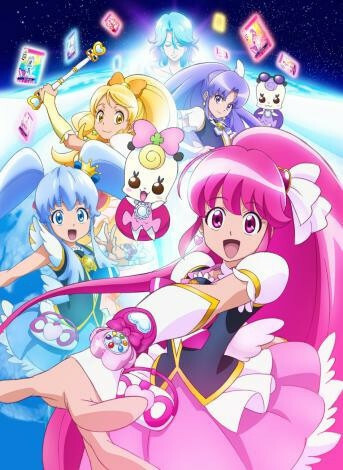 coming February 2nd and crossover movie PreCure All Stars New Stage 3: Eien no Tomodachi (Eternal Friends) scheduled to hit Japanese theaters on March 15, 2014. Both are previewed in new promos. 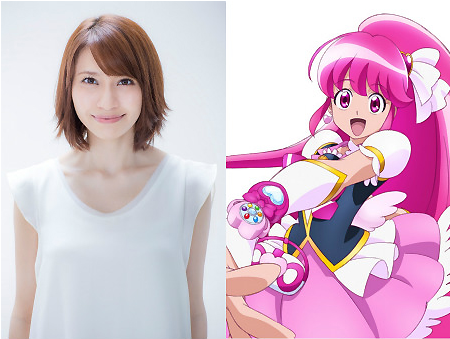 Megumi Nakajima, who is best known as the character/singing voice of Ranka Lee in Macross Frontier, plays the protagonist character Megumi Aino/Cure Lovely, who has the same first name with her. Nakajima recently announced that she will stop her musical activities as of March 31, 2014. Probably she will focus only on her voice actress activities after that. 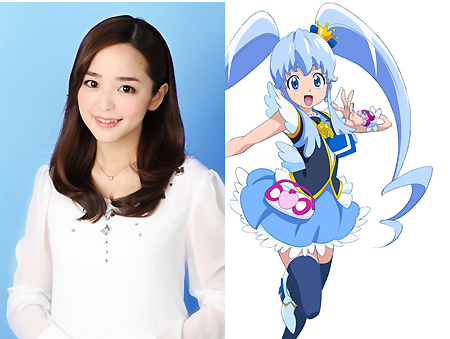 Megumi Han, who is currently voicing Gon Freecss in Hunter x Nunter and Chiari Tsukikage in Jewelpet Happiness, plays Hime Shirayuki/Cure Princess. 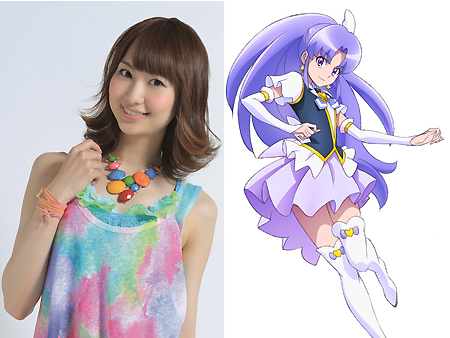 Haruka Tomatsu, a member of voice actress idol unit Sphere, plays the mysterious third PreCure girl Cure Fortune. 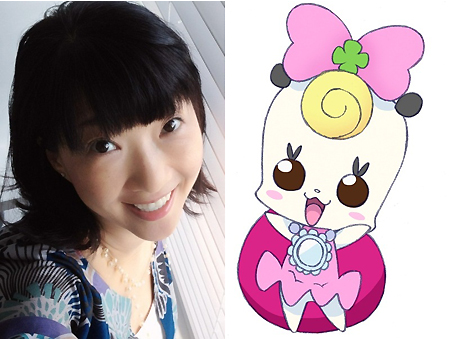 And 52-year-old veteran Naoko Matsui voices Ribbon, the partner fairy for Cure Lovely and Cure Princess. She previously played Ms. Shitataare, one of the villains in the third PreCure TV anime Futari wa PreCure Splash Star (2006-2007), and one of the most famous anime characters played by her is probably Roux Louka in Mobile Suit Gundam ZZ (1986-1987). The 11th PreCure TV anime Happinesscharge PreCure! will start airing in Japan on February 2, following the on-going series Dokidoki! PreCure. 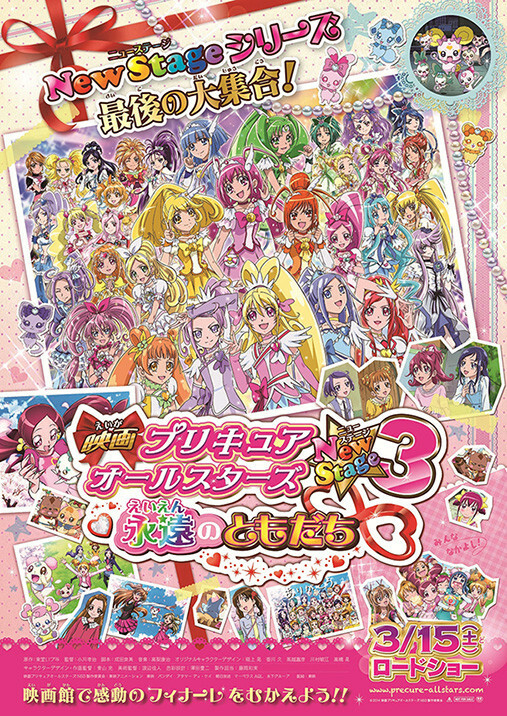 In addition to all of the PreCure girls and fairies, the poster includes the characters from the two previous New Stage films; Ayumi Sakagami (Cure Echo) from New Stage 1: Friends of the Future (2012), and EnEn & Gurelu from New Stage 2: Friends of the Heart (2013). And as always, the girls from the next TV series, which is scheduled to be premiere in February 2014, are also expected to join the film. The subtitle "Eien no Tomdachi" is the title of the theme song for the first two New Stage films sung by Mayu Kudou (NS1), and Kudou with Tomoyo Kurosawa and Hitomi Yoshida (NS2). Many fans have expected the title would be used for the final chapter of the New Stage series.